The first of many impulse purchases that I made was for a Kokadi Forest Birds wrap in teal colour. I bought this wrap in a size 6 from Tadpoles and Butterflies. My first impression was that this wrap was incredibly soft, right out of the box. The pattern was so cute, the birds look whimsical and fun, as most Kokadi patterns do. This wrap was very sturdy, it did not have much diagonal stretch at all, but felt very secure when wrapped. The wrap was a bit smooth for me, and did not have enough grip to keep passes in place very easily. 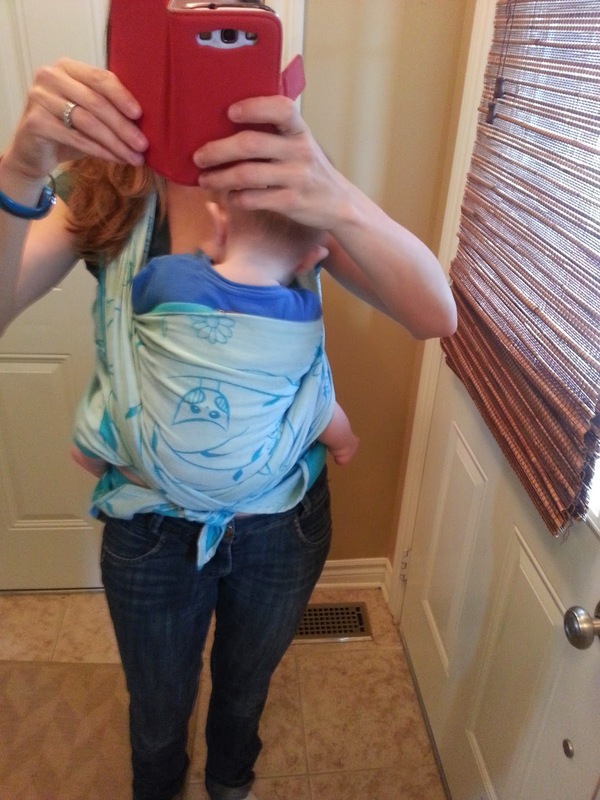 I ended up selling this wrap, as the grip and lack of stretch was just not right for us. A sloppy FWCC, wrong side out. Recommendation: If you are looking for a rock solid all cotton wrap that is both affordable and adorable, this would be it. If you like stretch and grip, this is not the wrap for you.